I have too many wonderful photos that do not see the light of day very often. It is so fun to pull them out and relive the memories. This category is dedicated to all those who made my childhood wonderful. And to my children, who will hopefully feel the same way someday. Me and my “girly pie” sisters. 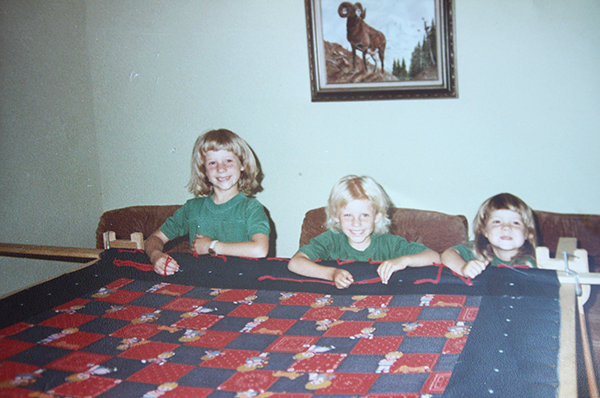 Ruth, Sarah and I. I believe this was the first time I ever quilted. I remember my job was to sit under the quilt and make sure the yarn was pulled all the way through so the knots did not bunch on the underside. I pretty much rocked that. I think I got to pose with the needle for the photo. I still have my quilt with my name stitched on the top. It’s a treasure. I stored it away for so long and then realized that was silly. Now my boys take turns sleeping under the warmth of that sturdy quilt. Sadly I also have Ruth’s right now (sorry Ruth! nothing like a public confession, no?). When we visited at Thanksgiving time it ended up in our van, hiding some Christmas presents. Ruth even reminded me to bring it in before we left. I noticed it was gone and thought Jim Bob had. Instead he had folded “my” quilt nicely and placed it in the back with our luggage. Ruth, I promise we will keep it safe until we see you next! That front room at my grandparents was one of my favorites rooms. Big soft couches, Grandpa’s paintings on the wall, geese pillows and relatively quiet. My cousins and I would play imaginative games for hours and pour over my Grandma’s hardback children’s books with the DI stickers still on. How I loved the sunshine filtering through the curtains and the view of the river from that front room. Heaven. you make me laugh Becky. I too kept my quilt very nice until I realized it was meant to be loved…and very sturdy…so now it is our picnic blanket. I’m glad you have it. Means you have to come visit for a picnic. 🙂 Love ya! A picnic it is! We’ll have to bring Autumn along. She is a fabulous picnic planner. Tonight she set one up with pizza and tortilla chips. She put a big vase of flowers in the middle of the blanket and had music playing. Fancy!